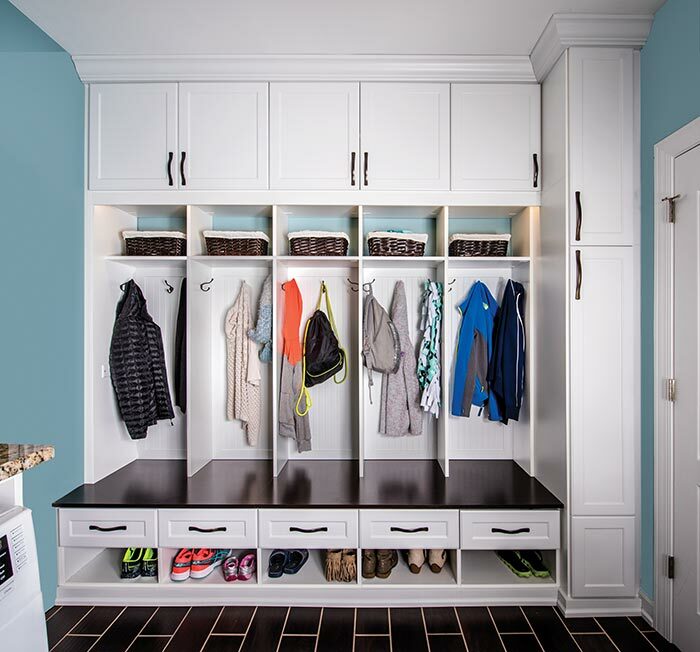 If you are tired of picking up children's coats off the floor, try replacig the traditional closet with an organization unit like this — Most children find putting a coat on a hook to be much easier than hanging something up in a closet. The lower heights of the hooks in combination with the built-in seating make this a kid friendly solution they might just use. Most families use their back door more than the front entry. Often, the back door becomes a drop zone for coats, backpacks, shoes, sports equipment and a myriad of items trekked in from the last outing. Combine that with piles of laundry and you're sure to have a mess. 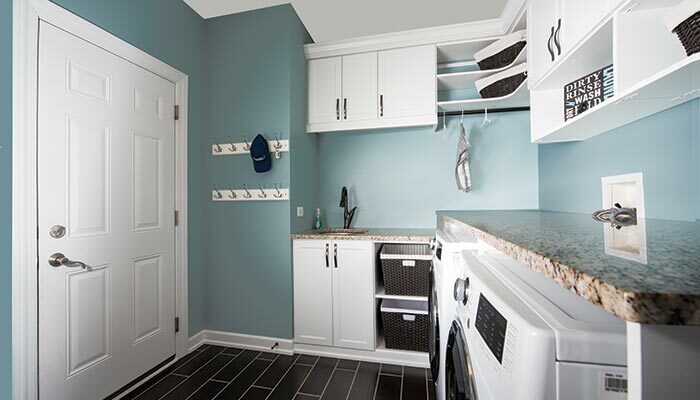 An efficient combination mud room/laundry room like this one will keep the entire family organized, making life easier and bringing a sense of order and tranquility to both children and parents alike. 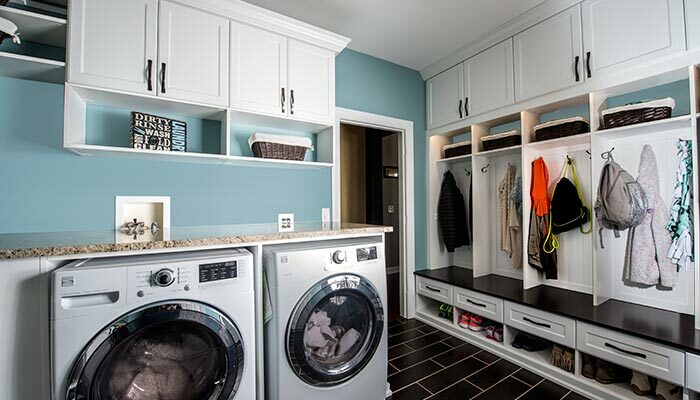 This mud room/laundry center replaces the traditional back hall closet with convenient cubbies — offering separate storage areas for each member of the family with room to store jackets, backpacks and shoes, plus plenty of space to sit down and put on footwear. Each cubby includes a shoe shelf and there is a drawer above the shoes to hold gloves and small items. A second vertical shoe cupboard to the side of the unit adds even more storage for footwear. No one will ever be late for an appointment due to an inability to find their matching shoe! The upper shelf includes abasket that is great for keeping keys, wallets and small things — making them easy to find as you're dashing out the door. 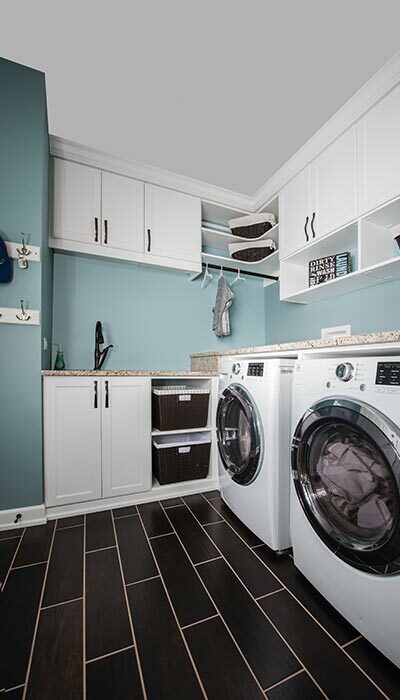 The laundry area includes cabinets and shelves for storage, a hanging rod for drip dry items, a sink with sink cabinet, and a lot of countertop space for folding and organizing clothing.